The last scene changes everything you saw before. I wish I could see it again for the first time. Made for shyamalan fans who have been waiting for him to make something great again. Rated PG-13 for disturbing thematic content and behavior, violence and some language. Not many directors have dragged their own name through the mud the way M. Night Shyamalan has. After the trifecta of The Sixth Sense, Unbreakable, and Signs, he burned everyone with the “twist” in The Village and the jig was up. What followed was the unfathomably awful quartet of Lady in the Water, The Happening, The Last Airbender, and After Earth. To say Shyamalan had fallen from grace was an understatement. After a two-year hiatus, he returned with Jason Blum as producer to deliver The Visit — while not a return to form — another notch on the “found footage” belt. Love-him-or-hate-him, Shyamalan was back and suddenly relevant again — it certainly helped to have launched the Wayward Pines TV show on Fox. And now, with Split, he’s finally making the comeback we all hoped was in him. Split is by far Shyamalan’s best film in 16 years. It’s hard to believe Unbreakable came out that long ago — and still stands as his best film. 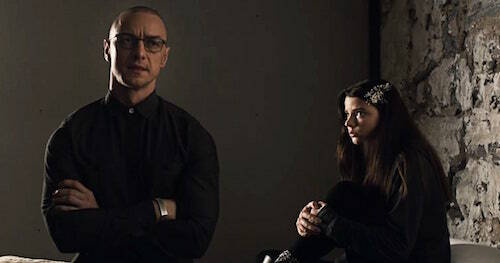 But Split is everything fans have been waiting for since we were all let down so spectacularly with The Village. He’s up to his old tricks and there is what some are calling a “twist” ending, but it’s more than that. And that’s all I can say about it. How we weren’t forced to sign non-disclosure agreements is beyond me. The last scene may not work for everyone, but I haven’t been this excited walking out of a movie since Cabin in the Woods. The first rule of talking about Split is you don’t talk about the ending of Split. Hopefully, Shyamalan’s early fans will come back out of the woodwork to bask in the glory of his return because this is the one we’ve been waiting for. Even without the last scene, it totally works on its own as one of the year’s first great thrillers. Intense from start to finish, the cast — hats off to McAvoy and Taylor-Joy’s performances — along with Shyamalan’s breakneck pacing keeps the audience riveted. My initial reaction walking out was “mind blown” and I immediately let a few enquiring minds know that they had missed out. There are some films you wish you could see again for the first time, Split is one of those movies. The best thing to do is trust in Shyamalan. We’ve been burned before, but there’s no need to fear here. Welcome back Shyamalan, this is the director we’ve missed!